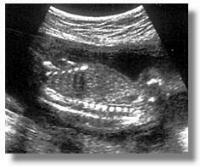 Ultrasound scanner technology continued to develop and improve in the 1980s. Real-time scanners had rather standard appearance, sizes and fabrication. They are usually portable on 4 wheels with the monitor on the top of the console and rows of receptacles at the bottom to accomodate a variety of scanner probes. See some of these scanners here. By the mid 1980s curvilinear or convex abdominal transducers have come into the market which have a better fit to the Obstetric abdomen and have a wider field of view further from the transducer face. Curvilinear arrays have completely replaced the linear configuration by the late 1980s. the increase in the number of transducer crystals (or channels, from 64 to 128), improvements in transducer crystal technology (going into broad-band and high dynamic range), increasing array aperture (more crystals firing in a single time-frame), faster computational capabilities, improving technical agorithms for focusing on receive (increasing the number of focal zones along the beam), incoporating automatic time-gain controls and progressively replacing analog portions of the signal path to digital. See a brief discussion on the linear and phased-array principles. Acuson Coporation®, a company founded in California in 1979, marketed their first model Acuson 128 System in 1983, employing a 128-channel "Computed Sonography platform" based on a software-controlled image formation process. The machine shook the ultrasound community with its excellent resolution and clarity (and also the price). Many other companies followed on similar system designs. Other innovative breakthroughs were seen in designs from companies such as ATL® (Advanced Technology Laboratories), GE® (General Electric) and Toshiba® . The early to mid- 1980s was the time with the heaviest proliferation of standard-setting good quality machines. By the early 1980s there were over 45 large and small diagnostic ultrasound equipment manufacturers worldwide. Image quality saw real improvements in the early 1990s. It is interesting to note that the availability of new and effective technologies to ultrasound scanners had also progressively stemmed from advances in technology in other areas of science such as radar navigation, telecommunications and consumer electronics. Such included the rapid developments in cellular telephones, micro-computers, digital compact and versatile disk players, and high definition TVs. The very high-speed digital electronics required for ultrasound application had become available at an affordable costs. The ultrasound imaging market alone would not have supported the development of these new technologies. (Model number of scanners made after 1980 from important manufacturers are listed here with the year in which they were marketed). all operate under digital electronics. Previously the beamformer (employing analog delay lines) and the signal processing stages are usually analog in their operation. The digital change-over was based on the very powerful computer platforms that were only available after the mid 1990s. The processor in the newer highend machines has the power equivalent of roughly 40 Pentium tm processors, executing some 20 to 30 billion operations per second. Most of the processing are also programmable software-based rather than hardware-based and allow for much more versatility and finer adjustments in the manipulation of beam signals. Signals from and to the transducer elements are digitized before any signal processing, which is one of the most important advancement in ultrasound technology in the 90s. It opened the venue for dealing with some of more difficult areas in ultrasound physics. Superfast digital beamformers allow for many times the number of focal points along the beam and produce microfine focal points on receive to the size of a screen pixel. 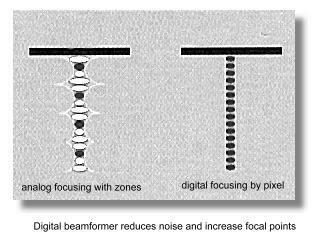 Digital beamforming also reduces noise in the signal processing by several hundred folds producing a much cleaner picture. 2. Extensive use of refined broad-band wide aperture transducers, improving both definition of tissue textures and dynamic range. With wide aperture transducers, transmit and receive apodization also allowed for the electronic reduction of the lateral array elements (sidelobes). In the early 1990s there was much improvements in transducer material design and fabrication technology allowing for higher frequency transducers, improved sensitivity and contrast resolution. The number of channels in high-end systems went up to 256 and more recently to 512 and 1024 (2-D arrays) in several high-end systems allowing for extremely wide aperture on transmission and reception. In ultrasound physics, the lateral resolution is the product of the wavelength and the f-number. The f-number equals the depth of the returning echo divided by the aperture of the beam. (the aperture of the beam is the width of the number of simultaneous firing transducer elements in the array, that means the larger the aperture the more elements are fired simultaneously). Therefore lateral resolution will be best (smallest) if there is a large aperture and short wavelength (higher frequency). Too large an aperture will slow the frame rate considerably and requires very fast computation and parallel processing. This has been made possible with the more recent digital electronics and the very powerful super-processors (see above). Many slightly older ultrasound systems are capable of using low f-numbers on reception at an affordable cost. However, they often employed large f-numbers on transmit in order to cover a large area. Significant improvement in lateral resolution requires low f-numbers both on transmit and receive. With the new 'very wide' aperture beamformer (often up to 128 channels), the transmit and receive f-numbers are lowered. The resulting improvements in lateral resolution can be as much as 4 times. 3. The phase data in returning ultrasound echoes, in addition to the amplitude data are processed in what is known as coherent image processing. The technique produced twice the amount of data from which to create ultrasound images of high resolution. The frame rate is also increased. The late 1990s has also seen transducer developing into 2D arrays which is made up of large number of elements arranged in rows and columns across the face of the transducer. Focusing occurs in two directions which produced a finer and clearer definition in both planes eliminating artifacts from adjacent tissue planes which may produce the partial volume effect. 4. The advent of tissue harmonic imaging. The technology, which has emerged as a major imaging trend in the last 4 years of the 1990s, made used of the generation of harmonic frequencies as an ultrasound wave propagates through tissue, dramatically reducing near field and side lobe artifacts. In a nutshell, tissue harmonic Imaging made use of lower frequency sound waves to improve penetration, while receiving and processing only the higher frequency echoes produced by the body's inherent harmonic characteristics. This process can reduce clutter and improve image clarity significantly. As ultrasound waves propagate through tissue, there is non-linearities in sound propagation that gradually change the shape of the wave, a shape change that can only result from the development of harmonic frequencies within the wave. There are no harmonic frequencies present at the transducer face. They develop gradually as the wave propagates through tissue, and so in the near field there is very little harmonic energy available for reflection from tissue. Since the near field is a source of much of the artifact in the ultrasound image, selective display of harmonic energy will show dramatically less near-field artifact. The strength of the harmonic energy generated is proportional to the square of the energy in the fundamental wave. Most of the harmonic energy results from the strongest part of the beam, and weaker portions of the beam (side lobes, for example) generate relatively little harmonic energy. selective harmonic imaging will yield a dramatically cleaner contrast between adjacent tissue structures. It is a sonologist dream come true. The black is black and the white is white. Much of the fuzzy picture noise that have made diagnosis difficult are gone. The development of harmonic imaging would not have been possible until the late 1990s as there must be excellent beam linearity on transmission and super sensitivity and dynamic range on receive to display the harmonic energy without an unacceptable amount of noise, as the harmonic signals are always much less in amplitude than the original fundamental signal. There must also be a very selective and fast digital filter within the receiver, to exclude the large percentage of the fundamental signal. Harmonic imaging is particularly useful in obese patients. From left to right: Changes in image quality from 1985, 1990 to 1995 respectively. dynamic range, and near and far field visualization. More significant improvements came after the mid-1990's. This image from ATL® * demonstrating fetal spine and cord. Ultrasound scanners came into different categories according to their performance and price. From the early 1980s, scanners have started to move into clinics and private offices and there is a trend to decentralise ultrasound services all over the world. Acceptance and demand from the lay public have also increased exponentially coupled with increased utilization by various medical specialties and sub-specialties. Standards and quality of scans became an emerging problem not seen in other areas of medical imaging, where Radiogists received the relevant training and underwent apppropriate examinations before running the service. Obstetricians were simply using the scanner probe as a torch to "look inside" the uterus. Standards varied and mis-diagnosis was not uncommon. Obstetricians and Gynecologists took on the fact that they are the more suitable persons to do the scans as compared to their radiological colleagues. Special training centers and accreditation boards were gradually set up by the health authorities in the United States, Australia, Europe and other countries. In the United States, an impetus for the development of ultrasonography was that medical insurance agencies such as "Blue Cross" had started re-imbursing ultrasonographic examinations since 1966. Medical sonographers also took up much of the responsibilities of the scans and sonography itself was recognised as a separate profession by the American Medical Association in 1974, the first sonography program being accredited in 1981 by the Joint Review Committee for Education in Diagnostic Medical Sonography ( the JRC-DMS). The American Registry of Diagnostic Medical Sonographers was founded in 1974 by the Society of Diagnostic Medical Sonographers (SDMS). Joan Baker was the first Chairperson. The AIUM gradually went beyond developing guidelines and established an ultrasound practice accreditation program. Since 1996, this voluntary program has accredited over several hundred ultrasound practices. To achieve accreditation in obstetrics-gynecology, physicians and sonographers must interpret a minimum of 170 ultrasound scans per year. In Australia, the Council of the Australian Society (ASUM) awards the Diploma of Diagnostic Ultrasound and the Diploma of Medical Ultrasound to medical practitioners and sonographers who sucessfully pass the examination. And in both a 'Consumer pull' and 'Technology Push' situation the diagnostic application of ultrasound in the field of Obstetrics and Gynecology continued to expand into new horizons. In 1975, that is before the advent of real-time equipments, in the United States there were only 5 legitimate indications in obstetric sonography: w measurement of the biparietal diameter (and other dating purposes), w determining amniotic fluid volume, w diagnosis of early pregnancy failure, w evaluation of multiple gestations and w placental localisation. The indications have since the early 80's expanded into at least 2 dozen, including most notably the accurate evaluation of fetal growth and the diagnosis of fetal malformations. Fetal biometry developed and 'flourished' in the 1980s as accurate fetal measurements do not require the prerequsite of very high resolution equipments. At least two dozen measurements were "invented" to assess gestational age and fetal size, each claiming their unique usefulness. Nevertheless by the mid 1980s only a few parameters were considered as standard measurements and ones that had "stood the test of time". These include the crown-rump length (CRL), the biparietal diameter (BPD), the head circumference (HC), the femur length (FL) and the abdominal circumference (AC). Many other measurements were considered useful only in situations where fetal dysmorphology was in question. Take for example the BPD, at least 200 charts are in used in the 1990s in different parts of the world (information supplied by commercial ultrasound scanner venders who set up the charts for their clients). 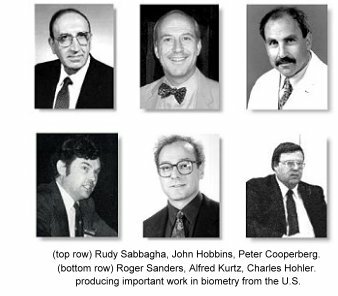 Early workers in the United States who have published extensively on fetal biometry include Rudy Sabbagha at the Northwestern University, Chicago, Alfred Kurtz at the Thomas Jefferson University, John Hobbins at Yale, Charles Hohler in Phoenix, Arizona, Peter Cooperberg at the University of British Columbia, Canada, David Graham and Roger Sanders at Johns Hopkins, Baltimore and Frank Hadlock and Russell Deter at the Baylor College of Medicine, Houston, Texas. There are others from Britain and Europe like Hansmann, Jouppila, Kurjak and Levi. Fetal biometry was explored from many different perspectives and in different populations. The abdominal circumference measurement which was described by Campbell and Wilkin in 1975 remained the mainstay measurement in the evaluation of fetal growth and nutrition. The assessment of gestational age and intrauterine growth retardation using ultrasonic parameters was the subject of a huge number of research papers. 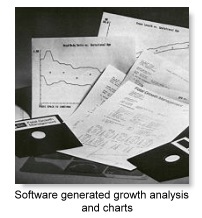 Fetal growth analysis and charting were also performed on desktop personal computers (PC) using commercial or home-made proprietory softwares. Estimation of in-utero fetal weight basing on the combination of the biparietal diameter and the thoracic circumference was first reported in 1965 by the Thompson group in Denver, Colorado. He reported an accuracy of within 300 grams in 66% of the weight estimates. This was followed by work from Garrett in Australia, Hansmann in Germany and Campbell in England. In 1977 the Hobbins' group at Yale published one of the most important papers in fetal biometry, "Estimation of fetal weight by computer-assisted analysis of fetal dimensions" which had started in the next 10 to 15 years, an almost non-stopping search all over the world for computer-generated models of fetal weight determination basing on multiple fetal parmeters. Similarily the craving to produce normograms for incremental growth of every 'measurable' part of the fetal body never stopped. One can find gestational-age normograms for parameters such as the Binocular diameter (Mayden K et al, 1982, Jeanty P et al, 1982), thigh circumference (Deter et al, 1983), clavicular length (Yarkoni et al, 1985), fractional spine length (Li DF et al, 1986), fetal foot length (Mercer BM et al, 1987) or fetal ear length (Birnholz JC et al, 1988); and charts for parameters such as cerebral ventricular width, cardiac chamber dimensions, chest circumference, limb lengths, renal and calyceal sizes that were of great value in the assessment of specific fetal anomalies. In 1987 E Albert Reece at Yale demonstrated the usefulness of the trans-cerebellar diameter as a growth-independent parameter to assess gestational age. Among many others, the comprehensive normograms of Frank Hadlock and Russell Deter from the Baylor College of Medicine, Houston, Texas were widely used. The group had in particular incorporated the femur length measurement into the calculations and popularised the concept of limb length/ trunk circumference ratios in the assessment of fetal growth. 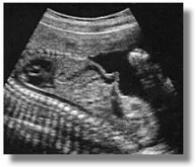 In the last 40 years or so in the development of ultrasonic fetal biometry, there has been much effort among the obstetric and ultrasound community to devise and develop fetal measurements that would be able to distinguish between fetuses that are small because of nutritional reasons and those fetuses that are "by nature" small. Head, limb versus abdomen ratios were once thought of be of promise but as it was noted that the growth-retardation process also affected fetal head and limb growth in varying degrees, the value of these ratios did not stand up to their initial expectations. Up to this day, there is still not one or several size measurement parameter in combination that can unequivocally diagnose growth retardation in the fetus when a woman is seen for the first time in the later part of pregnancy. Visualization of the the fetal yolk sac with the real-time scan was first described by Eric Sauerbrei and Peter Cooperberg in Vancouver, Canada in 1980. It is interesting to note that perhaps because of its size (and hence the difficulty to visualize with existing equipments at that time) its significance and usefulness in early pregnancy failures was not discussed until much later in the second half of the 1980s. The diagnosis of fetal malformations obviously received the enormous attention that was deserved and findings of many abnormalities diagnosable by ultrasound have been described. Ian Donald included a case of hydrocephaly in one of his early "introduction" ultrasound papers in 1961, which demonstrated "tissue interface within the body by ultrasonic echo sounding". In Bertil Sunden's thesis in 1964 there was description of the diagnosis of anencephaly in the third trimester using on the bi-stable Diasonograph. 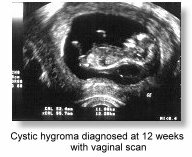 In 1968 D Hofmann and Hans Hollander in Germany reported on 9 cases of 'hydrops fetus universalis' diagnosed with the Vidoson (see Part 2) and William Garrett in Sydney reported the diagnosis by ultrasound of a fetus with polycystic kidneys using the CAL echoscope in 1970 (see also Part 1). These two papers were probably the two earliest papers describing formally the diagnosis of a congenital anomaly using ultrasound. Both reports were about cases in the third trimester and resulted in fetal death. The diagnosis and management of a 17 weeks anencephaly was reported as early as 1972 by Stuart Campbell using statc B-mode equipment. This was followed by the diagnosis of spina bifida in 1975. Both reports had appeared as landmark papers in the Lancet. They were the first cases of such conditions in which a correct diagnosis by ultrasound had effectively led to a termination of pregnancy. Manfred Hansmann in Bonn, Germany and John Hobbins at yale were among others, early pioneers in the ultrasonographic diagnosis of fetal malformations. With the advent of better real-time scanners, many more malformations were diagnosed, abeit in the late second trimester when fetal organs become more discernible on the scans. A review published in 1981 (Stephenson and weaver) reported that around 90 different fetal malformations had been diagnosed by ultrasound. 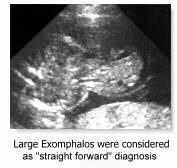 Common anomalies that were considered "straight forward" to diagnose at that time included anencephaly, hydrocephaly, exomphalos, duodenal atresia, polycystic kidneys, hydrops fetalis and limb dysplasias. More difficult areas for diagnosis of malformations were the fetal face, the fetal extremities and the fetal heart. The diagnostic accuracy progressively improved with more experience and better resolution machines. With the advent of the newer high-resolution scanners and the transvaginal transducer the diagnosis of these and other more subtle conditions were achieved, and particularly at an earlier gestation, moving from the third trimester of pregnancy to the second and later on to the first trimester in the latter half of the 1990's. Fetal trisomies, spina bifida and the more subtle cardiac anomalies were among the many examples. So-called soft signs and sonographic markers for chromosomal anomalies (see below) were started to be described. The diagnosis of fetal cardiac malformations gained foot in the early 1980s. Pioneers included the Wladimiroff group in Rotterdam, the Netherlands; the Hobbins group (Charles Kleinman, Greggory Devore, Joshua Copel, Peter Grannum .... ) at Yale; Lindsey Allan at Guy's Hospital, London (now in New York); L W Lange, David Sahn at Portland, Oregon; Kathryn Reed at Tucson, Arizona and Beryl Benacerraf at Harvard. The first real-time fetal heart images and quantitative data were published by the Lange, Sahn and Reed group in Tuscon, Arizona in 1980. Allan published her echo/anatomical correlates in the same year. Allan, a pediatric cardiologist, described systematically real-time normal and abnormal ultrasonic anatomy of the fetal heart which laid the foundation for subsequent studies. Using ultrasonic equipment available in the early 1980s and much painstaking enthusiasm and skill, she had very importantly shown that real-time cross-sectional study and diagnosis of fetal cardiac anomalies in utero in the second trimester was a distinct possibility and would no doubt develop into a distinctive diagnostic science. The improvements in diagnostic capabilities that came with the 'new technology' scanners in the 90's had tremendous impact on fetal cardiac diagnosis. The usefulness of direct doppler interrogation of fetal intracardiac flow was first demonstarted in 1985 by Dev Maulik and Navin Nanda (Professor of Cardiology) at the University of Alabama. Allan and Reed followed up with more publications. The Maulik group further demonstrated the value of color doppler in fetal cardiac studies in 1986. Greg Devore soon popularised the use of doppler color flow mapping in the assessment of fetal cardiac malformations and particularly in a screening situation in 1987. 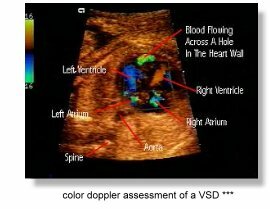 The use of color doppler has become indispensible in the diagnosis of more complicated cardiac malformations. By the late 1990s, the diagnostic accuracy of the nature of complex cardiac malformations in utero can be as high as 95 percent. Read also: the American College of Cardiology Position Statement on Doppler Echocardiography in the Human Fetus prepared by Charles Kleinman, James Huhta, and Norman Silverman which covers some of the historical aspects of fetal doppler echocardiography. The accuracy of diagnosing fetal malformations in a "high-risk" populations have been variously reported in the early 1980s right up to the early 1990s. These included some classic reports from Kurjak in Croatia (1980), Campbell and Pearce in London (1983), Gembruch and Hansmann in Germany (1984), Sabbagha in the U.S. (1985) and a good number of other authors. Diagnostic accuracies in "targeted" scans progressively increased with improvement in instrumentations and accumulation of knowledge about the ultrasound characteristics of the various anomalies. With improved resolution in the new equipment, diagnosis of fetal cardiac anomalies have moved into the late first trimester. All the improvements in machinery and earlier detection of abnormal structures in the fetus have nevertheless brought along with it "false positives" and difficult-to-be-sure-what-will-happen diagnosis that generate much undue anxiety in patients. Such has far-reaching effects on a woman's perception of child-bearing. Researchers try very hard to determine the course of events for a particularly abnormality or the implication and prognosis of a certain finding on ultrasound examination so that proper counselling can be done to alleviate anxiety and uncertainty from the diagnosis. "Textbooks" in Obstetrical and Gynecological sonography had emerged out of necessity because of the large amount of information that had become available and as reference materials of those sitting for examinations. Books had gone from being just overviews and atlases to systematic discussions of ultrasound techniques and findings. Notably the books by Peter Callen at the University of California, San Francisco (1983) and Sanders/James at Johns Hopkins were popular and represented two of the earliest standard textbooks in the field. Multiple authorship contributed to the excellence of these texts. Many other texts followed, some devoted mainly to special topics such as fetal anomalies or doppler ultrasound. The advent of the real-time scanners also prompted research into body movements and breathing movements of the fetus The study of fetal breathing movements (FBM) was first suggested by Geoffrey Dawes and K Boddy at the Nuffield Institute of Medical Research, Oxford Univeristy, England, in the early '70s, in that the presence or absence of breathing movements, theiir amplitude and intervals will be indicative of fetal well-being. Much research into these areas came from the Karel Marsal group at the University Hospital at Malmo, Sweden, the Tchobroutsky group at the Maternite de Port-Royal, paris, the Wladimiroff group at Rotterdam, and the Brian Trudinger group in Australia. all of them having switched to the use of real-time apparatus in the early to mid '70s. Wladimiroff demonstrated in 1977 that maternal hyperventilation decreased fetal breathing. The quantitative documentations of fetal breathing movements however require elaborate equipments, and was very time-consuming, so much so it would be difficult to be incoporated into clinical practice. The results also have wide overlap between positives and negatives. The advent of real-time had also raised hopes of being able to study physiological responses, sensations and behavior in the fetus. Again the assessment were time consuming and results were often equivocal, which made them unsuitable as clinical tests. Jason Birnholz at Harvard published several pioneering papers in these areas including the assessment of fetal movement patterns as a possible means of defining neurological developmental milstones in-utero and the development of fetal eye movements and possible 'dream states' in the feus. The study of FBM and FM patterns did not gain further popularity although the semi-quantitative counting of FBMs and the documentation of 'adequate" fetal body movements were popularised further in fetal biophysical profile scores made popular by Frank Manning and Lawrence Platt in Winnipeg and Los Angeles, who had started studies into FBMs round about the same time as their European counterparts. In 1980, Manning and Platt reported on the important finding that a reactive cardiotocographic finding was just as predictive as the presence of FBMs or total fetal movements. 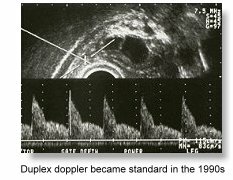 Spectral doppler or doppler velocimetry (the study of doppler waveforms), had evolved to become a standard tool in the late 1980's in the assessment of fetal wellbeing and compromise. (See Part 2 for more of its early development). Its advent in Obstetrics in the mid 1980s had fascinated (or perhaps misguided) many as the new promise in fetal assessment. The absence and reversal of end-diastolic flow in the umbilical arteries in severely compromised fetuses were striking demonstration of fetal pathophysiology , so was the finding of clear and unequivocal increase in diastoic flow in the middle cerebral arterial waveforms in mounting fetal hypoxia. It has also become clear that umbilical doppler velocimetry does not correlate with fetal weight in utero, nor is useful as a screening procedure. Stuart Campbell's group at the King's College Hospital in London reported in 1983 the evaluation of utero-placental flow velocity waveforms in compromised pregnancies with duplex doppler, and described the 'frequency index profile'. In 1984, P Reuwer in Utrecht, the Netherlands first discussed the ominous significance of absent end-diastolic flow in the umbilical artery. Further work from the Campbell group, including work from Gerald Hackett and T Cohen-Overbeek in 1986 and 1987 clearly demonstrated the prognostic significance of absent end-diastolic flow in the fetal descending aorta. In 1986, Brian Trudinger in Australia demonstrated that abnormal doppler waveform patterns tended to preceed abnormal cardiotocographic traces. In the same year the Wladimiroff group reported the value of middle cerebral artery waveforms in the assessment of severely compromised fetuses. Sanjay Vyas working at King's College Hospital in England described the use of renal artery waveforms in 1989. The value of fetal Venous blood flow in the assessment of fetal compromise was first suggested by Torvid Kiserud in Bergen, Norway in 1991. Giuseppe Rizzo at the Universita di Roma Tor Vergata in Italy furthered expounded the usefulness of the ductal venus velocimetry in fetal acidemia and cardiac decompensation. In 1987, Asim Kurjak introduced the use of color flow doppler in fetal assessment. Doppler ultrasound became a standard and indispensible tool in the evaluation of progressive fetal anoxia (the umbilical artery), compensation and decompensation (the middle cerebral artery), acidosis and progression to cardiac failure and emminent fetal death (the ductus venosus). It has also been employed in the assessment of women at risk of pre-eclampsia and utero-placental arterial compromise, leading to early and effective therapeutic intervention. It is of interest to note that historically, these velocimetric parmeters have appeared each a number of years apart with increasing sophistication of the apparatus. By the beginning of the 1990's, most mid- to highend ultrasonic equipments had incoporated duplex doppler as standard facility. In the mid 90's, color flow mapping had also found its way into most mid- and highend machines. Aside from aiding cardiac diagnosis (see above), impressive flow images were often popularly reported such as those found in Vasa Previa and the fetal Circle of Willis. As early as 1967, and basing on the Vidoson, Hofmann and Hollander in Germany had discussed the importance of placental localization using ultrasound before amniocentesis. Jens Bang and Allen Northeved in Copenhagen described ultrasound-guided amniocentesis in 1972. In the mid 1970s to early 80s, genetic amniocentesis was largely performed under static B-scan ultrasound guidance. An ultrasound scan was performed to locate a feasible pocket of amniotic fluid before a tap, which was done basically without actually seeing the needle tip going into the fluid pocket. With the advent of real-time scanners, a small number of centers had in the late 1970s started to perform amniocentesis by simultaneously visualizing the puncture needle tip on the scanner monitor. One such pioneer was the Birnholz group at Harvard who used an early phased array for the purpose. Needle-guide adapters soon became available from ultrasound manufacturers which could be coupled to the linear array or phased array sector probes where the needle passed through a fixed path either parallel or at an angle to the ultrasonic beam. These were cumbersome to use however, particularly in a busy setting. They also had serious problem of keeping the equipment sterile. The adapters may also increase the risk of traumatisation as it did not allow for the 'desired' and sensitive placement of needles. Many centers started to do it freehand with an assistent holding onto the transducer probe that was commonly wrapped in a sterile adhesive drape. In 1984, Wolfgang Holzgreve in Basel, Switzerland described a large series of over 3000 'freehand' amniocentesis with low complication rate. Similar experience was also reported by Lawrence Platt in Los Angeles, who emphasised on the need for the transducer probe to be manipulated by the same operator which resulted in better hand-eye co-ordination. In the following year, Roberto Romero at Yale formally described the single operator two-hands technique in amniocentesis and the reduction in the number of multiple taps and bloody taps associated with the procedure. Most centers soon adopted this single operator technique, which had become popular because of it convenience and effectiveness. Chorionic Villus sampling (CVS) also relied heavily on sonographic guidance. Z Kazy and his group in the USSR reported in 1980 fetal sexing and enzyme assay on chorion biopsies taken at 6 -12 weeks' gestation, using either an endoscopic or ultrasound-guided approach. RH Ward in London and Bruno Brambati in Milan both reported transcervical CVS under ultrasonic guidance in 1983. Brambati reported the success rate of obtaining chorionic villi rose from 75% without ultrasound to 96% with ultrasound guidance. Danish investigators Steen Smidt-Jensen and N Hahnemann first described the ultrasound-guided transabdominal approach in 1984. Other adjunctive ultrasonic techniques were reported by the Brambati group and the Golbus group in San Francisco in 1985. The Beryl Benacerraf group at Harvard (se below) reported the feasibility of early amniocentesis (11-14 weeks) in 1988. In 1990, the same group reported an early fetal loss rate of over 2.3%. Several important reviews in the mid-90s confirmed this high incidence of fetal loss. The practice has for this reason not gained general acceptance. Read here a short history of Amniocentesis, fetoscopy and chorionic villus sampling. Other interventional intra-uterine diagnostic and therapeutic procedures also started to catch on. After fetoscopy, ultrasound-guided pure fetal blood cordocentesis was pioneered in France in 1983 by Fernand Daffos. Pure fetal blood was aspirated in-utero at around 18 weeks from the umbilical vein near the placental insertion of the cord using a twenty gauge needle under ultrasound guidance. Their group reported the first case of Haemophilia A diagnosed in-utero by this method. The procedure was also popularised around the same time in England by the Stuart Campbell and Charles Rodeck group at King's College Hospital. 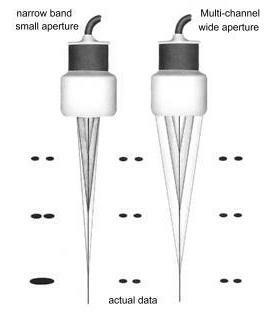 The Hobbins group at Yale described their technique in 1985 and called the procedure percutaneous umbilical blood sampling (PUBS). This replaced blood sampling via fetoscopy which the group had pioneered in 1974. Kypros Nicolaides at King's developed the single operator two-hands method and became a leading figure in cordocentesis exploring many important aspects of fetal physiology and pathophysiology. With the advent of color flow mapping, the technique has become even more accessible. In 1988, Umberto Nicolini, working with Charles Rodeck at the Queen Charlotte's Maternity Hospital in London, first described fetal blood sampling from the intrahepatic portion of the umbilical vein in the fetus, as an alternative procedure in cases where cord needling was unsuccessful. In the late 1980s fetoscopy has mainly been reserved for tissue or organ sampling, and fetal blood sampling are always done via the ultrasonic-guidance needle procedure. The commonest indication of fetal blood sampling has evolved to become one of quick confirmation of abnormal karyotype in the 22-24 weeks fetus, when a chromosomal abnorrmality has been suggested on ultrasound scan. Various in-utero drainage procedures under ultrasound guidance were described in the late 1980s such as the drainage of Chylothorax and hydronephrosis, and the treating of fetuses by transfusion into the umbilcal vessels. Selective reduction of the number of fetuses in cases of triplet or quadruplet pregnancies was first described by Richard Berkowitz in New York in 1988, using intra-cardiac potassium chloride injections given under ultrasonic control. Vesico-amniotic shunt placement was described by the Mitchell Golbus group (with Michael Harrison, Roy Filly, Peter Callen .... ) in San Francisco in 1982. The group became one of the most important forerunners in fetal surgery and continued to make many new fetal surgical innovations. In that year, they published their multicenter classic paper "Fetal Surgery 1982" in the New England Journal of Medicine. With improved resolution from transvaginal sonography, Mark Cullen at Yale first reported in 1990 a large series of congenital anomalies detected in the first trimester using transvaginal ultrasound, and pointed out the importance of a good understanding of normal embryonic development in such diagnosis. Many studies followed around the same time reporting on the usefulness of the first trimester transvaginal scan in the evaluation of fetal anomalies. Moshe Bronshtein, working in Haifa, Israel, described extensively since the early 1990s results of transvaginal sonography in the first trimester. A similar report to Cullen's also appeared in 1990. Ilan E. Timor-Tritsch, working in Israel and later on at New York University, followed on with many reports on fetal anatomy and anomalies systematically studied using high resolution transvaginal transducers in the first trimester, opening up convincingly a new area in fetal ultrasound diagnosis, that of "sono-embryology". Timor-Tritsch was also credited for organizing the first three transvaginal ultrasound courses in the United States. 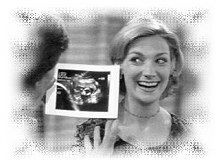 As ultrasound became a widely available and popular investigation, it contributed heavily to several population screening programs that took place between the late 70's and the 90's. The first was the Maternal serum alpha-feto protein (MSAFP) screening programs for the detection of neurotube defects (NTD). It started in the United Kingdom in the late 1970s, notably in parts of Scotland, where the prevalence of NTDs was high. In 1972, David Brock and R Sutcliffe measured the AFP values in the amniotic fluid of 31 pregnancies with anencephaly and 6 pregnancies with spina bifida. All of the cases of anencephaly and most of those with spina bifida demonstrated markedly elevated AFP levels. This was a landmark 'discovery' in the history of prenatal diagnosis. In 1974, Nick Wald and co-workers at the University of London reported in the Lancet maternal serum AFP levels in 7 pregnancies with open neural tube defects which were significantly higher than that in 14 other controls. This led to the idea of measuring MSAFP in screening for NTDs. The 19-centers U.K. Collaborative study in 1977 subsequently demonstrated the utility of this test for prospective open neural tube defect screening. Similar results were arrived at in large-scale studies in the United States in 1979. By 1984, MSAFP screening had also become part of standard antenatal care in the U.S.
As scanner resolution and sonography skill improved, ultrasound gradually replaced amniocentesis in the diagnosis of screened-positive cases. By the mid-1990s amniocentesis is often not performed in patients with elevated MSAFP levels. Either a positive or negative diagnosis is made basing solely on ultrasound findings. The second was the routine fetal scan at 20 weeks which had progressively become an integral part of antenatal care in the early 1990's. In the late 1970s a number of large scale population ultrasound screening studies have been described variously from London, Germany, Brussels, Sweden, Norway, Finland and other countries in Europe and in the United States. At least 20 similar large-scales studies were reported up to the year 1990. There is apparently a distinct difference in the attitude towards routine ultrasound screening between the Europeans and the Americans. Routine screening scans were introduced in Germany in 1980, in Norway in 1986 and in Icelend in 1987. The scans basically try to date the pregnancy, exclude twins and detect any fetal malformations that may be present. In the U.S., routine scans in pregnancy has however been looked upon with much controversy and their cost-effectiveness and validity in improving 'quantifiable' perinatal outcome has not been firmly established. Nevertheless, those who argue for a routine scan would claim that parents have a natural desire to know if any fetal congenital anomaly is present or if there is any health compromise in the fetus. Being able to reassure the parents is a natural part of prenatal care. Two important large scale studies emerged to address the issue: the RADIUS study (Routine Antenatal Diagnostic Imaging with Ultrasound) with a cohort of 15,000 low-risk pregnancies in the United States in 1993 and the Eurofetus Study in Europe in 1997 in which 200,000 low-risk pregnant women in 60 hospitals had obstetric ultrasound examinations performed in centers proficient in prenatal diagnosis. Salvator Levi was the Project leader of the Eurofetus Study Group and a strong proponent for routine screening. A 61% overall detection rate of structural anomalies in the Eurofetus study contrasted sharply with the 35% overall detection rate in the RADIUS study. In order to address the conflicting data and conflicting opinions on this topic, a conference was held at The Rockefeller University in New York City, in June 1997, sponsored by the New York Academy of Sciences. Over 150 scientists and clinicians participated in the meeting, with highly informative presentations and discussions.
" .... In summary .... we have tried to put together comprehensive state-of-the-art information on the routine obstetric ultrasound controversy. Our conclusion .... is that routine obstetric ultrasound is warranted for all pregnancies, but only if it is performed in a quality manner. Although there is still scientific and economic controversy about our conclusion, we would argue that, at a minimum, there is an ethical obligation to present the option of an 18-22-week routine obstetric ultrasound examination in clinical centers in which quality ultrasound is available. We hope that our efforts will move public policy in this direction and encourage further discourse on this most important topic in contemporary obstetrics." --- Preface, Ann NY Acad Sci 1998 847: 1-ix. A discussion on the findings of these two important studies can also be found here. In any case, by the late 1990s and the turn of the century, an ultrasound examination for each and every pregnancy at 20 weeks has become quite standard practice worldwide, as long as facilities are available. As the skill of ultrasonographers and equipment improved the diagnostic accuracies of the examinations also improved. This improvement is also brought on by the large number of ultrasound training courses throughout the world. Some, like the fetal echocardiography course at Guy's Hospital in London has been shown to effectively improve the pick-up rate of congenital heart defects in certain parts of the United Kingdom. Many other centers in the United States, Europe and the United Kingdom, also run well-attended and effective courses in the prenatal ultrasound diagnosis of congenital anomalies. Guidelines formulated by accreditation bodies also have a positive effect on ensuring quality of the examinations. The third was the screening for chromosomal abnormalites, notably Down syndrome, which became popular in the mid 1990's. Screening basing on multiple biochemical parameters in the low-risk population had started around 1990 in some centers and because of its relative convenience had soon caught on and become standard antenatal care in many parts of the world. Screening basing on ultrasonic parameters had not become popular until the mid-1990s. 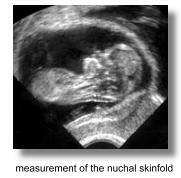 Measurement of the nuchal translucency, which was first described by Beryl Benacerraf and her group at the Harvard Medical School in 1985 formed the basis of such screening. Working with fetuses between 15 and 20 weeks of gestation her group discovered good correlation between a thickened nuchal skin fold that was above 5mm and the presence of Down syndrome in the fetus. Benacerraf had also earlier on published biometric parameters (shorter femurs and humerus, and decreased femur length/ biparietal diameter ratios) as markers for the diagnosis of Down syndrome which formed one of the earliest observations and endeavours for an "indirect" diagnosis of chromosomal anomalies. Endocardial cushion defect, atrial and ventricular septal defects, omphaloceole, pyelectasis, choroid plexus cyst, echogenic cardiac foci, echogenic bowels, hypoplasia of the middle phalanx of the fifth digit and simian creases were considered as other 'indirect' or 'soft' signs of fetuses with Down syndrome. "..... Although many fetal anomalies -- such as anencephaly, hydrocephalus, and anterior abdominal wall abnormalities -- can now be diagnosed sonographically even in the second trimester, more refined diagnosis involve examination of the face and extremities. It is not sufficient, however, to diagnose isolated cleft lip and palate or a clubfoot. Rather, the presence of these lesions should stimulate the ultrasonographer to seek a pattern and fit the pieces of the puzzles together in order to recognize the syndromes associated with chromosomal anomalies ......"
The reason for the seemingly 'late' popularity of 'ultrasonic' screening was probably twofold. Much time was spend initially on making the measurement at 16-19 weeks (following important work from Benacerraf, James Crane, Hélène Grandjean and others) and not at 11-14 weeks as practised now (see below). Measurement of the nuchal fold at this latter gestation is demanding on operator skill and machine resolution and is also error prone. With improved resolution of ultrasound scanners, better understanding of fetal patho-physiology and more emerging data, ultrasonic screening for nuchal fold thickness has moved from between 16 and 19 weeks (using a cutoff level of around 6mm) to between 11 and 14 weeks (using a cutoff of around 3mm) in the first trimester. Kypros Nicolaides and his group at King's published the landmark paper in 1992 in the British Medical Journal, where the measurement of nuchal translucency between 11 and 14 weeks was used to screen for Down syndrome. He demonstrated the importance of likelihood ratios in the detection. The group later on turned out some of the most important data regarding the appication of nuchal translucency measurements including risk estimates and the quantitization of the measurement into gestational-age related multiples of the median (MoM). Read also: A discussion on the Nuchal Translucency from an online book by Kypros Nicolaides, NJ Sebire and RJM Snijders. In Gynecology, ultrasound has started as a diagnostic tool in the differentiation and assessment of solid, cystic or mixed masses in the pelvis. Even in the late 1970s (still very much a static-B era), it has already become a well-established and indispensibe tool in the evaluation of a variety of pelvic pathologies. In 1976, the B-J Hackelöer and Hansmann group in Germany, basing on the static B-scan, reported on the successful monitoring of follicular size and number in patients undergoing ovulation induction. A 'very-full' bladder was a pre-requisite for good visualization of the ovaries. Follicular growth was noted to be linear and is around 1-4mm/day in the pre-ovulatory time period and follicles ovulate when they reach 15 to 28 mm in diameter. Other morphological parameters were also described. Ultrasound monitoring was 'formally' introduced into ovulation induction programs in 1979. By about 1980-82 there were a number of important reports attesting to the usefulness of abdominal ultrasound in the assessment of follicular development and ovulation. In 1982, the Colm O'Herlihy, Lachlan de Crespigny and Hugh Robinson group at the Royal Women's Hospital in Melbourne, Australia, published on important follicular size criterion and protocols for ovulation inductions. Other important early work had also come from the Joupilla group in Finland, the Lopata group in Melbourne, the Queenan and O'Brien group in England and the Fleischer group in Tennessee. Transvaginal scanners replaced the abdominal counterparts after they became available in the mid 1980's. The addition of endometrial evaluation using transvaginal scanning enhanced diagnostic accuracies in the mangement of ovulation induction cycles. Follicular and edometrial sonography, although tremendously useful when used in combination with estrogen assays was unable to ro predict ovulation and avoid multiple pregnancies. Vaginal sonography had also become indispensible in the evaluation of non-palpable masses, ascites, uterine and cervical leisions, early pregnancies and the localization of IUCDs. It's value as a tool in the diagnosis of ectopic pregnancies and ovarian and edometrial cancers was extensively re-evaluated in the late 1980's and later on in the early 90's with addition of transvaginal color flow imaging (see below). As mentioned the greatest development of transvaginal imaging in the late 1980s has been in assisted reproduction, where all aspects of diagnosis and management are incomplete without a vaginal scan. From initial assessment for pelvic pathologies to surveillance of ovarian follicles and edometrial responses with or without medications, to ovum retrieval in In-vitro fertilization/ embryo transfer cycles, vaginal sonography had become essential and indispensible. The diagnosis of ectopic pregnancies continued to be a challenge, despite better machines and the transvaginal approach. A number of authors such as Roberto Romero at Yale devised diagnostic criterion for making a diagnosis, combining the use of sonography, HCG levels and color doppler assessment, which allowed a vast majority of the diagnosis to be made. Interventional sonography in gynecology dated back to the early 1970s when Hans Henrik Holm described percutaneous puncture of ovarian tumours in 1972. They performed over 500 procedures with very few serious complications. It was not until 1982 that David Graham and Roger C Sanders at the Johns Hopkins Hospital, Baltimore, revisited the idea of transvaginal aspiration of pelvic masses under transabdominal ultrasound guidance. There was a necessity to develop similar techniques for the retrieval of follicles in IVF programmes which has hitherto been achieved only through laparoscopy. Susan Lenz and JG Lauritsen at the University Hospital Rigshospitalet in Copenhagen described percutaneous transabdominal - transvesical aspiration of ovarian follicles in 1981 and 1982 which showed for the first time that ovum retrieval can be performed as an ultrasound-guided and out-patient procedure. Transvaginal ovum retrieval under abdominal ultrasound guidance was further described by Norbert Gleicher in Chicago in 1983 in a letter to the Lancet and several months later by the P Dellenbach group in Shiltigheim, France in 1984. They reported for the first time successful pregnancies (5 out of 30 patients) using this technique. They further reported on favorable results in 1985 in more than 100 cases of oozyte retreival using this 'transabdominal scan - transvaginal puncture' method. The advantage of this technique is that the ovaries are more accessible and the procedure is safer and relatively pain free. More importantly, the procedure is repeatable on an out-patient basis, and dramatically cuts down the cost of the IVF procedure. The true impact on ovum pickup came with the appearance of the mechanical transvaginal sector scanner from Kretztechnik in 1985 when Wilfried Feichtinger and Peter Kemeter in Austria described its use in transvaginal aspiration of ovarian follicles for IVF. Since then, ovum retrieval had steadfastly become an outpatient routine compared to just a few years ago when it was done as a laparoscopic procedure under general anaesthesia. The technique has also found its way into many ultrasound-guided interventional procedures in gynaecology (refer to Part 2). Campbell's group at Kings (with John Parsons) was among one of the earliest pioneering groups to have set up an out-patient oocyte retrieval service in IVF. In 1989 Campbell's department was the first to publish on a large scale screening project for ovarian cancer using abdominal ultrasound over a span of 5 years. Their results showed a low positive predictive value. Subsequent to this Paul DePriest's group in Kentucky published in 1993 results in ovarian cancer screening using the vaginal approach which arrived at similarily low postitive predictive values. Morphological scoring systems to improve the diagnosis of ovarian cancer in ultrasound-detected pelvic masses were described by several workers, notably Ilan E. Timor-Tritsch and AM Sassone in 1991. Results of studies appeared to indicate that many women would undergo surgical procedures to diagnose relatively few cancers. It has so far not been convincingly demonstrated that screening will reduce morbidity or mortality from ovarian cancer or for that matter improve the health status of women. Bengt Karlsson and Seth Granberg in Helsinki, Finland reported in 1994 the use of endometrial thickness measurement (over 5mm) to predict endometrial cancer. The application of doppler ultrasound in gynecology did not appear until the mid 1980's when Kenneth Taylor at Yale described blood flow in the ovarian and uterine arteries in 1985 and Asim Kurjak in Croatia pioneered the use of transvaginal color doppler in the assessment of the pelvic circulation in 1989. Kurjak was the founder of the Ian Donald Inter-University School of Medical Ultrasound in Dubronik, one of the largest and most important Ultrasound schools in the world. 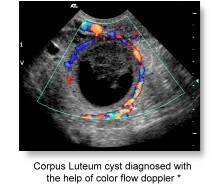 The Coatian group continued to contribute heavily to the applications of trans-vaginal color doppler in Obstetrics and Gynecology. It should be mentioned here that the use of transvaginal 2-D, doppler and color doppler ultrasound almost started around the same time in the late 1980s, and one finds the introduction of vaginal doppler studies almost coincided with the first reports on vaginal sonography. Work also came out from the United States from the Arthur Fleischer group in Nashville, Tennessee in the early 1990s on ovarian tumour vascularity using transvaginal color doppler. The group had around the same time published other important work on transvaginal ultrasound in gynecology. Color flow imaging of Intra-follicular blood flow and impedance in the uterine arteries during assisted reproductive cycles further added to the diagnostic capabilities of vaginal doppler ultrasound. The work of Tom Bourne and the group at Kings also confirmed the usefulness of color doppler in refining the prediction of ovarian cancer in ovarian masses, and in a screening setting. Their group had also made exhaustive investigations into the use of transvaginal color doppler in the diagnosis of a variety of gynecological conditions. They have also documented the usefullness of periovulatory blood flow in ovarian and uterine arteries in the management of assisted reproductive cycles. In Color power imaging (Power doppler), red or blue luminosity is used to indicate the power or amplitude of the blood flow signal. The process is more sensitive than color velocity imaging. The display of color from image areas with low amplitude echoes can by adjustment be inhibited and only high amplitude echoes are displayed and color coded according to their power or velocity. The process has been called "Tissue doppler imaging" by W N McDicken in England in 1992. This was expounded in 1994 by K Miyatake and M Yamagishi in Japan in the evaluation of left ventricular wall motion. The development had come about with the availability of more powerful electronics. Further developments had also led to the degree of tumor vascularization being quantitatively estimated. The approach has received much attention from the gynecology sector in the investigation of pelvic malignancies. Three-dimensional ultrasound comes of age. Visualization of the fetus in 3-D has always been on the minds of many investigators, including Tom Brown in Glasgow in the early 1970s, who had developed an elaborate Multiplanar scanner in 1973, under the Sonicaid Ltd®. With improvements in ultrasonic and computer technology, work on three-dimensional visualization began to appear in the early 1980's. Some basic computer algorithms came from the group at Stanford (JF Brinkley, WD McCallum and others) and also from the Holm group at Gentofte, Denmark. Other work came from the domain of cardiologists where initial efforts were directed to acertaining the volume of cardiac chambers. Real-time scanner probes mounted on articulated arms were often employed where positions of the probe can be accurately determined. The principle has always been to stack successive parallel image sections together with their positional information into a computer. Kazunori Baba at the Institute of Medical Electronics, University of Tokyo, Japan, first reported on a 3-D ultrasound system in 1984 and succeeded in obtaining 3-D fetal images by processing the raw 2-D images on a mini-computer in 1986. Their setup was reported in the Acta Obstetrica et Gynaecologica Japonica. Baba, with Kazuo Satoh and Shoichi Sakamoto at the Saitama Medical Center described the improved equipments in 1989 in which they used a traditional real-time convex array probe from an Aloka SSD280 scanner mounted on the position-sensing arm of a static compound scanner (Aloka M8U-10C). The images obtained were processed on elaborate computer systems (see picture with description below). 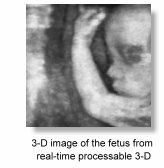 This approach successfully produced 3-D images of the fetus which were nevertheless inferior to that produced on convenional 2-D scanners. At the same time, to generate each 3-D image it took on an average some 10 minutes for data input and reconstruction making the setup impractical for routine clinical use. Baba published in 1992 in the Japanese language the first book on ultrasonography in Obstetrics and Gynecology which contained chapters on 3-D ultrasound. In the mid 1990s, Baba collaborated with ALOKA® with technology developed at the Biomedical Engineering Department of the Tokyo University, and was a driving force in the development of commercial 3-D ultrasound technology in Japan. Another group at the Columbia University led by Donald King described in 1990 other approaches and computer algorithms for 3-D spatial registration and display of position and orientation of real-time ultrasound images. HC Kuo, FM Chang and CH Wu at the National Cheng Kung University Hospital in Taiwan, Republic of China, reported in 1992 3-D visualization of the fetal face, cerebellum, and cervical vertebrate using a the Combison 330 from Kretztechnik®, Zipf, Austria. The Combison 330 which appeared in 1989, was the first commercial 3-D scanner in the market. The Taiwanese group were also the first to describe 3-D visualisation of the fetal heart in the same year although at that time they were only able to image static parts in 3-D. In 1987, the Center for Emerging Cardiovascular Technologies at Duke University started a project to develop a real-time volumetric scanner for imaging the heart. 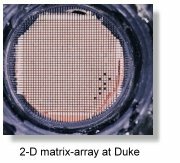 In 1991 they produced a matrix array scanner that could image cardiac structures in real-time and 3-D. In 1994, Olaf von Ramm, Stephen Smith and their team produced an improved scanner that could provide good resolution down to 20 centimeters. The team developed state-of-the-art "Medical Ultrasound imaging" integrated circuits (MUsIC) which were capable of processing signals from multiple real-time phased-array images. The microprocessors were developed in collaboration with the Volumetric Medical Imaging Inc. at Durham, North Carolina. The MUsIC 3.2, a 40MHz 1.2µ chip completed in 1994, was the basis for the beam-former in the world's first electronically steered matrix-array 3-D ultrasound imager. This became available commercially from Volumetric Medical Imaging, Inc. in 1997. The matrix-array transducer, which steered the ultrasound beam in three dimensions, contained 2,000 elements in which 512 were used for image formation. The beam-former produced 4,096 lines running at 30 frames per second. This required as much ultrasound signal processing power as eight top-end 2-D systems, running on microprocessors that execute instructions 30 times the speed of a typical 2 GHz Pentium tm. Due to the relatively small size of the 2-D matrix array probe, it is more suited to cardiac examination rather than for the abdomen. The apparatus is also costly to produce and poses problem in manufacturing and in image quality due to the large amount of crystals and interconnections. Other pioneering investigators included Ian Kelly and John Gardener at the Middlessex Hospital in London and the Sturla Eik-Nes group at Tronheim, Norway, using equipments from Vingmed® which were partly developed at the University's bio-engineering department (see Part 2) . They were able to demonstrate early gestational age fetuses with their apparatus. Wilfried Feichtinger at the University of Vienna, Austria reported images of 10 weeks embryos imaged with 3-D transvaginal transducers in 1993. Kretztechnik®. had in this year marketed their 2nd generation 3-D scanner the Voluson 530D. Alfred Kratochwil had continued his support in the development of 3-D technology at Kretztechnic® and was active in the teaching of 3-D sonography after his retirement. The Ulrike Hamper group at Johns Hopkins reported images of various congenital malformations with a prototype 3-D scanner. Computation was based on a 486 computer together with a RISC processor (860/240 mhz). Thomas Nelson and Dolores Pretorius at the University of California, San Diego, approached the carotid arteries with their prototype 3-D system in 1992 and produced very successful images. The signal chain consisted of a transducer-array moving along the patient's neck producing sequentially sampled images which were digitised, acquired and surface-rendered on the connecting workstation. They collaborated with development by Donal Downey and Aaron Fenster at the Imaging Research Laboratories of the John Robarts Research Institute at the University of Western Ontario, Canada. Their group continued to make refinements to the instrumentation and started to publish on fetal visualization in the following years and continuing on to become one of the most important research teams in the field of 3-D ultrasound in Obstetrics and Gynecology. In 1996, Nelson's group and the Medical Imaging group at the university College Hospital in London published independent researches on 4-D (motion 3-D) fetal echocardiography, using sonographic cardiac gating methods to remove motion artefacts, which are present with conventional (static) 3-D methods. A useful feature of 3-D display is the cine loop, in which the rendered 3-D volumes are viewed as they rotate. This capability enhances depth perception and gives a true 3-D perspective of both normal and abnormal structures. In 1995, Eberhard Merz at the Center for Diagnostic Ultrasound and Prenatal Therapy, University of Mainz, Germany, demonstrated the usefulness of multiplanar orthogonal imaging as well as as surface views and transparent views in the diagnosis and confirmation of fetal surface and skeletal anomalies such as cleft lips and complex multiple malformations. He and his co-workers reported a large series of over 600 cases of fetal diagnosis using 3-D ultrasound. In 1997, his team reported on the diagnosis of facial anomalies using trans-vaginal 3-D scans. In Obstetrical and Gynecological 3-D imaging, mechanical designs appeared to be the only popular choice. Two-dimensional arrays are mechanically moved to provide the third dimension by sweeping or rotating, using either constrained free-hand adapters or an existing probe alongside with an external motion-sensing system. The most sucessfully deployed transducer design is the mechanically-driven arrays that is built-in into the probe housing from the Austrian manufacturer Kretztechnik®. Their technique was described in the paper "3D ultrasound - the Kretztechnik Voluson approach" in the European Journal of Ultrasound in 1994. The process of acquisition is microprocessor-controlled and automatic. In the display of the acquired data, the degree of transparency is first chosen which involves applying a mixture of ray-traced, volume-rendered illumination and maximum intensity or summed voxel projection. Perception in 3-D surface is acheived by a combination of depth shading, color-mapping, texture mapping and ray-traced volume rendering. The introduction of Multiplanar reformatting has allowed the generation of any arbituary slice within the data aquired. In obstetrics this is valuable for measurement, and for obtaining re-constructed critical views (such as the 4-chamber view) or scans orthogonal to the face and soft palate. All these are heavily dependent of the software algorithms and processing power of the computers within the machines. Volume rendering in medical imaging has in fact much of its roots in computer graphics engineering. Volume rendering developed as a separate body of techniques, mainly within the computer graphics literature, before and independent of its application to medical data. One of the earliest pioneers in volume rendering is Marc Levoy at the University of North Carolina (now at Stanford). Volumes are rendered directly from sampled data without first creating an intermediate surface representation. This creates images that represent the underlying data very accurately and can reveal fine details that might be obscured with surface methods. Following his initial paper in 1988: "Display of Surfaces from Volume Data" where he described the classic volume ray tracing algorithm and has been the basis (directly or indirectly) for most commercial 3D ultrasound systems, Levoy has published a number of papers that have continued to break new ground. Volume rendering has made a major impact on the many scientific, engineering and medical disciplines that create and display large multi-dimensional datasets. Many of the volume rendering agorithms and technology had actually originated from computer scientists at the filmmaking company Pixar Animation Studios, famous for its 3D computer animated films! Initial volume rendering techniques and agorithms weres "invented" by company founders Robert Drebin, Loren Carpenter, and Pat Hanrahan. The algorithm embodied three key ideas: Directional shading based on the gradient in a volume, digital compositing to combine the slices of a volume, and Image warping, also applied to a volume. Gradient shading of volumes first appeared in a 1986 paper by Karl-Heinz Hoehne, hamburg, who called it graylevel gradient shading. Compositing can be traced through Thomas Porter and Tom Duff's 1984 paper to Edwin Catmull and Alvy Ray Smith's invention of the alpha channel in the mid-70's. Image warping is a special case of texture mapping, which dates back to Edwin Catmull's 1974 PhD thesis at the University of Utah. (From citations by Dr. Marc Leroy, Stanford University. Excerpted with permission). Medison®, which had acquired Kretztechnik® in 1996 continued to produce more advanced versions of the Voluson series of scanners that produced some of the best 3-D images in the market. Bernard Benoit in Nice, France working in collaboration with Kretztechnik®, published some of the earliest, most stunning and convincing 3-D images in the mid- 1990s using prototype Voluson scanners (see picture of cleft lip on the left). His pictures had been responsible for drawing the attention of many to this new scanning modality. 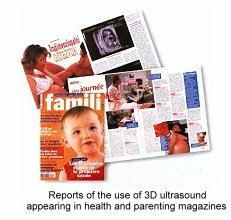 In the second half of the 1990's at least twenty other important centers worldwide were embarking on distinctive laboratory and clinical research into 3-D ultrasound, usually backed by work done at their own university's medical physics and bio-engineering departments, or commercial enterprises. Many of the innovations relied heavily on software programming. 3-D ultrasound technology would not have been a viable commercial proposition if not for the fact that computer technology was in the mid to late 1990s at a stage where the computations can be done with staggering speed and at an acceptable cost. In November 1996, with technical assistance from Takashi Okai and Shiro Kozuma from ALOKA®, Kazunori Baba published in the Lancet their initial experience with real-time processable 3-D, which used a simpler algorithm compared to conventional 3-D rendering. Fetal surfaces are demonstrated in near real-time imaging basing on simple 'accoustic impedance thresholding' to identify fetal surfaces in the amniotic fluid. Image quality was very high and required less expensive computers to make the calculations. However the viewing direction is limited to that of the probe so that a desirable direction may not always be possible. Sufficient amniotic fluid is also prerequisite to a good scan. Similarily image clarity depends on the difference between the accoustic impedance of the fetal skin and that of amniotic fluid which made good images difficult to obtain before 20 weeks. Aloka® adapted the technology into their commercial scanners. Other early manufacturers of 3-D systems included ATL®, Tom-Tec Imaging Systems®, GE-Vingmed®, 3D-EchoTech®, and Life Imaging Systems Inc.®. The first English textbook on 3-D ultrasound in Obstetrics and Gynecology came out in 1996 which was edited by Kazunori Baba and Davor Jurkovic, King's College Hospital, London. Eberhard Merz hosted the First World Congress on 3-D Ultrasound in Obstetrics and Gynecology in Mainz in 1997. Many important teething issues surrounding the new practice of 3-D sonography were discussed. In 1999 the 3D Focus group was formed by the ISUOG to look after matters concerning the practice and education of 3-D ultrasound in Obstetrics and Gynecology. The increasing availabililty of 3-D ultrasound has resulted largely from the rapid advancement in computer technology and the decreasing cost of micro-processor electronics. The benefits that 3-D has bought to ultrasound diagnosis has quickly become a matter for debate. The important advantages of 3-D over conventional 2-D ultrasound as it is at the turn of the millenium are its ability to enhance maternal-fetal bonding, improved comprehension of certain fetal anomalies by parents, Improved recognition and better confirmation of certain anomalies such as cleft lips, polydactyl, micrognathia, malformed ears, club foot, vertebral malformations and other anomalies appearing on the 'exterior' of the fetus, consequent to the benefit of volume and surface rendering. The development of transvaginal 3-D probes have further enhanced its value in the early diagnosis of congenital malformations. ".... the main advantages of three-dimensional ultrasound in perinatal medicine and antenatal diagnosis include scanning in the coronal plane, improved assessment of complex anatomic structures, surface analysis of minor defects, volumetric measuring of organs, "plastic" transparent imaging of fetal skeleton, spatial presentation of blood flow arborization and, finally, storage of scanned volumes and images. It is our decided opinion that three-dimensional sonography has gained a valuable place in prenatal diagnosis, becoming a necessity for every modern perinatal unit .... ". Stuart Campbell at the St. Georges Hospital in London was one of the early proponents for the 3-D scan to be an important catalyst for mothers to bond to their babies. What are known as 're-assurance scans' and the perhaps misnamed 'entertainment scans' have started to develop. The attraction of being able to look at the face of your baby before birth was enthusiastically reported in lay parenting and health magazines. Manufacturers had adopted an unprecedented "profit marketing" strategy to advertise to providers and "reverse marketing" strategy to advertise to consumers, particularly after the arrival of the 4-D (dynamic or motion 3-D) machines. Barbara Maier and his group (Horst Steiner, Alf Staudach etc.) in a study in Salzburg in 1996 reported that mothers are more incentive to endure pregnancy-related difficulties, reduced anxiety, and improved capacity to cope. Pretorius reported in the same year that improved bonding between the mother and fetus could motivate mothers to refrain from smoking and other harmful behaviors during pregnancy. Usefulness has been reported for calculating volumes of the gestational sac, fetal lungs and heart from second trimester to term, placental volume, liver volume, and thigh and abdominal volume for the estimation of fetal weight. Andreas Lee with the Kratochwil group evaluated the accuracy of fetal weight estimation using 3-D abdominal and thigh volumes and reported in 1994 similar mean errors as compared to standard 2-D evaluations. Fong-Ming Chang's group at the National Cheng Kung University Hospital in Taiwan, Republic of China reported in 1997 the feasibility of predicting birth weight by upper arm volume measured in 3-D. In 1998, Harm-Gerd Blaas at Tronheim, Norway published 3-D studies of embryos that were less than 10mm and further expanded the usefulness and importance of 3-D sonography as an in-vivo research tool in fetal embryology. Transvaginal 3-D work on early fetal anatomy and malformations had also come out of Ilan Timor-Tritsch's center in New York. 3-D power doppler in the study of placental blood circulation was first described in 1996 by C J Ritchie in a proprietary setup at the Bioengineering Department of the University of Washington, Seattle. Dolores Pretorius published on its usefulness and techniques in 1998. The Croatian group led by Asim Kurjak and Sanja Kupesic expounded this new diagnostic entity further. Their book "Three-Dimensional Power Doppler in Obstetrics and Gynecology " was published in 2000. In gynecological applications, Davor Jurkovic at Kings convincingly demonstrated in 1995 the usefulness of 3-D ultrasound in accurately differentiating uterine anomalies such as bicornuate uterus and septate uteri. Similarily the assessment of the endometrial cavity with 3-D sonohysterography and characterization of endometrial masses, adhesions, tubo-ovarian masses, hydrosalpinges, ovarian cysts, small intraovarian tumors and mullerian anomalies have all been quickly and convincingly demonstrated. Diagnostic accuracy of malignant ovarian tumors can be up to 100 percent as reported by Bonilla-Musoles in 1995, who also demonstrated the value of 3-D examination over the convention 2-D transvaginal scans and 2-D sonohysterography in the diagnosis of endometrial lesions. 3-D color power doppler is valuable for visualization of intra-tumor flow and thus is useful in evaluating in particular cervical carcinomas and ovarian carcinomas. It is envisaged that the investigation will lead to greater appreciation of tumor angiogenesis. Another potential benefit of 3-D ultrasound lies in data documentation, storage, and networking. Digitally saved volumes of patient data can be readily transferred to a remote site for interpretation or second-opinion consultation. How much these all add up to make 3-D ultrasound cost-effective and an indispensible tool in Obstetrics and Gynecology will remain to be seen. The evolution of diagnostic ultrasonography has been the combined efforts of physicists, mechanical, electrical and bio-medical engineers, computer technologists, clincians, sonographers, researchers, university and government administrators as well as adventurous and perceptive commercial enterprises. I particularly salute the ingenious engineers and physicists throughout the history of the development as they are the true heroes behind the entire 'scientific' advance in ultrasonic imaging. Without them the innovative ideas of the brightest clinicians cannot be put into action. Developments in echocardiography, neurosonography, ophthalmology and breast echography have all supplemented the advancement in ultrasound instrumentations and methodologies in Obstetrical and Gynecological sonography. The first linear-arrays for example were invented for the purpose of ophthalmologic and cardiac investigations. Ultrasonography has very quickly become the single most important diagnostic investigation in the field of Obstetrics and the healthcare for women. Interestingly, diagnostic medical ultrasound had evolved from technology used in mapping waves through liquid (the sonar), through air (the radar) and through solids (the metal-flaw detector). The A-scan which had evolved from the sonar and early metal-flaw detectors would not have a lasting impact on clinical medicine without evolving into the B-scan which had it's origin in the military radar. The A-scan did not provide sufficiently accurate, reproducible and interpretable information to allow a firm diagnosis to be made, particularly in Gynecology. The bistable B-scan would not have advanced to become a respectable diagnostic tool as it is now, without the development of the scan-converter and gray-scaling. The gray scale compound static scanner, with the incorporation of progressive electronic and computer technology available in the late 1970s had establish itself as a genuine stand-alone clinical diagnostic tool, providing hitherto unavailable information to the clinician regarding a particular disease condition. Howry's original concept of deriving clear outline anatomical pictures by selectively recording larger echoes from major interfaces and suppressing any other small echoes was completely reversed in later developments, where attempts are made to detect the smallest echoes in the presence of noise and displaying them in finer spatial detail and echo amplitudes. The arrival of the real-time scanners have added further impetus to ultrasound techniques and had established ultrasonography as the most important imaging modality in Obstetrics and Gynecology. The concept of the transvaginal scanner was in situ in the early 1950's but was unable to make any real headway until the appearance of sophisticated mechanical and electronic sectoral real-time vaginal scanners in the mid 1980's. Ovum retrieval has for example, interestingly gone from a transabdominal scan - transabdominal puncture approach to a transabdominal - transvaginal approach and further onto the universally accepted transvaginal - transvaginal approach. A 'technology push' situation further evolved when enhancement in diagnostic capabilities of scanners was propelled by the almost explosive advancements in electronic and microprocessor technology, occurring most significantly in the 1980s and 90s. The advent of ultrasonography in Obstetrics has also 'created' the new specialty called Prenatal diagnosis that has developed by leaps and bounds since it's early conception. Ultrasound has markedly enhanced and pushed forward the study of congenital abnormalities among obstetricians, pediatricians, geneticist, pathologist and other allied specialties. All of a sudden, obstetricians started to learn about so many congenital malformations that they have not even heard of. On the other hand, every single measurable parts of the fetus has been measured and their changes throughout gestation documented. It is of interest to note that historically the 4 basic fetal measurements, namely the BPD, the CRL, the AC and the FL had evolved successively at different time periods (' 62/' 68, ' 73, ' 75, ' 80 respectively) each being brought on by technical developments in ultrasound instrumentations at that time (B-scan, gray-scale, real-time). Stuart Campbell published the first BPD chart in 1971. Since then, charts and tables had become an important and integral part of Obstetric practice, at which Obstetricians and Gynecologists were slowly getting used to. Fetal malformations were diagnosed with increasing accuracy and at an earlier gestation. Bold, daring and visionary clinicians and researchers invented new interventional techniques that work under the guidance of ultrasound to diagnose fetal disease and gynecological conditions. Doppler devices moved progressively from depicting flow velocity waveforms to color flow mapping, power doppler and doppler tissue imaging. Velocimetric parameters of the umbilical artery, the middle cerebral artery and the ductus venosus had made their appearance one after another again subsequent to progressive developments in the imaging apparatus. 3-D ultrasound made the scene in the late 1980's and further revolutionarised sonography in obstetrics and gynecology. It is regretable that John Wild's original conception of precise quantitative detection of cancer echoes with ultrasound also had not materialize to the initial expectations. So was the application of tissue characterization in the specialty. On the other hand, all the improvements in machinery and earlier detection of abnormal structures in the fetus have nevertheless brought along with it "false positives" and difficult-to-be-sure diagnosis that could generate much undue anxiety in patients. Such could only have far-reaching effects on a woman's perception of child-bearing. I am still finding it awsome to imagine the "wire-frame" images of Douglass Howry and Ian Donald could have now become "photo-realistic", and between all these are the unfolding magnificence of the invention and genius of science and man's endeavour to find-out and to perfect. From the detection of life to the measuring of fetal sizes; from the determination of morphological normality to the evaluation of circulatory and growth dynamics, all have been making profound changes to the entire concept of routine antenatal care and Obstetric practice. Shepard MJ, Richards VA, et al. (1982) An evaluation of two equations for predicting fetal weight by ultrasound. Am J Obstet Gynecol 142:47. Donald I., Brown TG. (1961). Demonstration of tissue interfaces within the body by ultrasonic echo sounding. Br. J. Radiol. 34: 539-546. Sunden B. (1964). On the diagnostic value of ultrasound in obstetrics and gynaecology. Acta Obstet. Gynecol. Scand. 43(Suppl. 6). Garrett WJ, Grunwald G, Robinson DE. (1970). Prenatal diagnosis of fetal polycystic kidney by ultrasound. Aust. N. Z. J. Obstet. Gynaecol 10: 7-9. Allan LD, Tynan MJ, Campbell S, et al. (1980) Echocardiographic and anatomical correlates in the fetus. Br Heart J 44:444. Maulik D, Nanda NC, Moodley S, Saini VD, Thiede HA (1985) Application of Doppler echocardiography in the assessment of fetal cardiac disease. Am J Obstet Gynecol 151:7 951-7. Maulik D, Nanda NC, Hsiung MC, Youngblood JP. (1986) Doppler color flow mapping of the fetal heart. Angiology 37:9 628-32. Kurjak A, Kirkinen P, Latin V, Rajhvajn B. (1980). Diagnosis and assessment of fetal malformations and abnormalities by ultrasound. J. Perinat. Med. 8: 219-235. Campbell S, Pearce JM. (1983). Ultrasound visualization of congenital malformations. Br. Med. J. 39: 322-331. Gembruch U, Hansmann M. (1984). Gezielte sonographische Ausshlussdiagnostik fetaler feblbildungen in risikogruppen. Gynäkologe 17: 19-32. Sabbagha RE, Sheikh Z, Tamura RK et al. (1985). Predictive value, sensitivity, and specificity of ultrasonic targeted imaging for fetal anomalies in gravid women at high-risk for birth-defects. Am. J. Obstet. Gynecol. 152: 822-827. DeVore GR, Horenstein J, Siassi B, Platt LD. (1987) Fetal echocardiography. VII. Doppler color flow mapping: a new technique for the diagnosis of congenital heart disease. Am J Obstet Gynecol 156:5 1054. Wladimiroff JW, Tonge HM, Stewart PA. (1986) Doppler ultrasound assessment of cerebral blood flow in the human fetus. Br J Obstet Gynaecol 93:5 471. Vyas S, Nicolaides KH, Campbell S. (1989) Renal artery flow-velocity waveforms in normal and hypoxemic fetuses. Am J Obstet Gynecol 161:1 168. Kiserud T, Eik-Nes SH, Blass HG, et al. (1991) Ultrasonographic velocimetry of the fetal ductus venosus. Lancet 338:8780 1412. Rizzo G, Capponi A, Ardini D, et al. (1994) Ductus Venosus celocity waveforms in appropriate and small for gestational age fetuses. Early Hum Dev 39:1 15. Birnholz, JC. (1981). The Development of Human Fetal Eye Movement Patterns. Science 213: 679-681. Busnel, Marie-Claire, Granier-Deberre, C. and Lecanuet, J. P.(1992). Fetal Audition. Annals of the New York Academy of Sciences 662:118-134. Hofman D, Mast H and Hollander HJ. (1967) The importance of placenta localization by means of ultrasonics for amniocentesis. Geburtsh Frauenheilk. 27: 1199. Nicolini U, Santolaya J, Ojo OE, Fisk NM, Hubinont C, Tonge M, Rodeck CH. (1988) The fetal intrahepatic umbilical vein as an alternative to cord needling for prenatal diagnosis and therapy. Prenat Diagn 8:9 665-7. 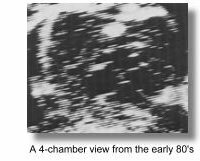 Cullen MT, Green J, Whetham J, Salafia C, Gabrielli S, Hobbins JC (1990) Transvaginal ultrasonographic detection of congenital anomalies in the first trimester. Am J Obstet Gynecol 163(2):466. Cullen MT, Reece EA, Whetham J, Hobbins JC. (1990) Embryoscopy: description and utility of a new technique. Am J Obstet Gynecol 162(1):82. Rottem, S., Bronshtein, M. (1990). Transvaginal sonographic diagnosis of congenital anomalies between 9 weeks and 16 weeks, menstrual age, J. Clin. Ultrasound, 18, 307-314. Bronshtein. M., Blumenfeld, Z., Drugan, E., Ophir, H., Yoffe, N., Peer, E., Brandes, J.M. (1991). Detection of fetal cardiac malformations by transvaginal sonography in the first and early second trimester. Am. J. Obstet. Gynecol., 1 (Supp 1), 85. Benacerraf BR, Barss VA, Laboda LA. (1985) A sonographic sign for the detection in the second trimester of the fetus with Down's syndrome. Am J Obstet Gynecol 15 151:8 1078. Goswamy RK, Campbell S, Chamberlain J. (1986) Screening for ovarian cancer. IARC Sci Publ 76 305. Bourne TH, Campbell S, Reynolds KM, et al. 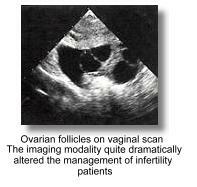 (1993) Screening for early familial ovarian cancer with transvaginal ultrasonography and colour blood flow imaging. BMJ 306:6884 1025. Holm H.H (1972) Ultrasound as a guide in percutaneous puncture procedures. Ultrasonic 10:83, 1972. Graham D, Sanders RC (1982) Ultrasound guided transvaginal aspiration biopsy of pelvic muscles. J. Ultrasound in Med. 1:279. Lenz S (1981) Collection of Human Oocytes in IVF by Ultrasonically guided follicular puncture. Lancet I, 1163. Lenz S, Lauritsen JG (1982) Ultrasonically guided percutaneous aspiration of human follicles under local anesthesia: a new method of collecting oocytes for in vitro fertilization. Fertil Steril Dec 38:6 673-7. Gleicher N (1983) Egg retrieval for IVF by sonographically controlled vaginal culdocentesis. Lancet II, 508-509. Dellenbach P, Nisand I, Moreau L, Feger B, Plumere C, Gerlinger P, Brun B, Rumpler Y (1984) Transvaginal, sonographically controlled ovarian follicle puncture for egg retrieval. Lancet 1:8392 1467. Dellenbach P, Nisand I, Moreau L, Feger B, Plumere C, Gerlinger P (1985) Transvaginal sonographically controlled follicle puncture for oocyte retrieval. Fertil Steril 1985 44:656-62. Kemeter P, Feichtinger W (1986) Trans-vaginal oocyte retrieval using a trans-vaginal sector scan probe combined with an automated puncture device. Hum Reprod 1:21-4. Feichtinger W, Kemeter P (1986) Transvaginal sector scan sonography for needle guided transvaginal follicle aspiration and other application in gynaec, routine and research. Fertil. Steril. 45; 722-725. Timor-Tritsch, I.E., Monteagudo. A., Peisner, D.B (1992). High frequency transvaginal sonographic examination for the potential malformation assessment of the 9 week to 14 week fetus, J. Clin. Ultrasound., 20, 231-238. Taylor KJ, Burns PN, Woodcock JP, Wells PN. (1985) Blood flow in deep abdominal and pelvic vessels: ultrasonic pulsed-Doppler analysis. Radiology 154:2 487. Kurjak A, Zalud I, Jurkovi D, Alfirevi Z, Miljan MT. (1989) Transvaginal color Doppler for the assessment of pelvic circulation. Acta Obstet Gynecol Scand 68:2 131. Brinkley JF, SK Muramatsu, Wd McCallum, RL Popp. (1982) n vitro evaluation of ultrasonic three dimensional imaging and volume system. Ultrasonic Imaging 4:126. Fredfelt KE, HH Holm, JF Pedersen. (1984). Three dimensional ultrasonic scanning. Acata Radiol Diagn 25: 237. Moritz WE, Pearlman AS, McCabe DH, et al. (1983) An ultrasonic technique for imaging the ventricle in three dimensions and calculating its volume. IEEE Trans Biomed Eng 30:8 482. Baba K, Satoh K, Sakamoto S, et al,. (1989) Development of an ultrasonic system for three-dimensional reconstruction of the fetus. J Perinat Med 17:1 19. King DL, King DL Jr, Shao MY. (1990) Three-dimensional spatial registration and interactive display of position and orientation of real-time ultrasound images. J Ultrasound Med 9:9 525. Kuo HC, Chang FM, Wu CH, et al. (1992) The primary application of three-dimensional ultrasonography in obstetrics. Am J Obstet Gynecol 166:3 880. Kelly IM, Gardener JE, Brett AD, et al,. (1994) Three-dimensional US of the fetus. Work in progress. Radiology 192:1 253. Feichtinger W. (1993) Transvaginal three-dimensional imaging. Ultrasound Obstet Gynecol. 3:375. Hamper UM, Trapanotto V, Sheth S, et al,. (1994) Three-dimensional US: preliminary clinical experience. Radiology 191:2 397. Pretorius DH, Nelson TR, (1991) 3-Dimensional Ultrasound Imaging in Patient Diagnosis and Management: The Future. Ultrasound Obstet Gynecol 1(6) 381. Pretorius DH, Nelson TR, Jaffe JS. (1992) 3-D Sonographic Analysis Based on Color Flow Doppler and Gray Scale Image Data: A Preliminary Report. J Ultrasound Med 11:225. Nelson TR, Pretorius DH. 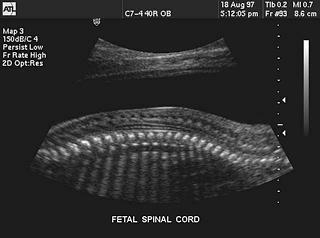 (1992) 3-Dimensional Ultrasound of Fetal Surface Features. Ultrasound Obste Gynecol 2:166. Nelson TR and Elvins TT. (1993) Visualization of 3D Ultrasound Data. IEEE Computer Graphics and Applications 13(6):50. Nelson TR, Pretorius, DH. (1993) The Future of Three-Dimensional Ultrasound. Diagn Imaging Technol Report 2:173. Pretorius DH and Nelson TR. (1994) Prenatal Visualization of Cranial Sutures and Fontanelles with Three-Dimensional Ultrasonography. J Ultrasound Med 13:871. Pretorius DH and Nelson TR. (1995) Fetal Face Visualization Using Three-Dimensional Ultrasonography. J Ultrasound Med 14:349. Nelson TR, Pretorius DH, Sklansky M, Hagen-Ansert S. (1996) Three-dimensional echocardiographic evaluation of fetal heart anatomy and function: acquisition, analysis and display. J Ultrasound Med 15: 1. Deng J, Gardener JE, Rodeck CH, Lees WR . (1996) Fetal echocardiography in three and four dimensions. Ultrasound Med Biol 1996; 22: 979. Kirbach D, TA Whittingham. 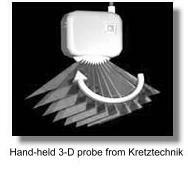 (1994) 3D ultrasound-the Kretztechnik Voluson approach. Eur J Ultrasound I 85. Blaas HG, Eik-Nes SH, Berg S, et al. (1998) In-vivo three-dimensional ultrasound reconstructions of embryos and early fetuses. Lancet 352:9135 1182. Merz E, Bahlmann F, Weber G. (1995) Volume scanning in the evaluation of fetal malformations: a new dimension in prenatal diagnosis. 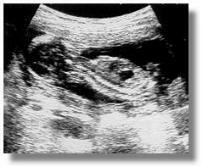 Ultrasound Obstet Gynecol 5(4):222. Merz E, Weber G, Bahlmann F, Miric-Tesanic D. (1997) Application of transvaginal and abdominal three-dimensional ultrasound for the detection or exclusion of malformations of the fetal face. Ultrasound Obstet Gynecol 9(4):237. Merz E, Bahlmann R, Weber G. (1995) Volume scanning in the evaluation of fetal malformations: a new dimension in prenatal diagnosis. Ultrasound Obstet Gynecol 5:222-227. Merz E, Bahlmann R, Weber G. Macchiella D. (1995) Three-dimensional ultrasonography in prenatal diagnosis. J Perinat Med 23:213-222. Maier B, Steiner H, Wieneroither H, Staudach A. 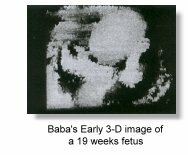 (1997) The psychological impact of three-dimensional fetal imaging on the fetomaternal relationship. In: Baba K, Jurkovic D, eds. Three-dimensional ultrasound in obstetrics and gynecology. New York: Parthenon, p. 67-74. Pretorius DH, House M, Nelson TR, et al. (1995) Evalustion of normal and abnormal lips in fetuses: comparison between three- and two-dimensional sonography. AJR 165:1233-1237. Pretorius DH, Nelson TR, et al. (1995) Fetal face visualization using three-dimensional ultrasonography. J Ultrasound Med 14:349-356. Pretorius DH. (1996) Maternal smoking habit modification via fetal visualization. University of California tobacco related disease research program. Annual report to the California State Legislature, 1996:76. Lee W, Comstock CH, Kirk J, et al. Birthweight prediction by three-dimensional ultrasonographic volumes of the fetal thigh and abdomen. J Ultrasound Med 16:799-805. Liang RI, Chang FM, Yao BL, et al. (1997) Predicting birth weight by upper-arm volume with use of three-dimensional ultrasonography. Obstet Gynecol 177(3):632. Ritchie CJ, Edwards WS, Mack LA, Cyr DR, Kim Y. (1996) Three-dimensional ultrasonic angiography using power-mode Doppler. Ultrasound Med Biol 22:277-286. Pixel focusing image courtesy of Medison ®. * Copyrighted ATL®, reproduced with permission. ** 3-D image and image of the hand-held probe courtesy of Dr. Bernard Benoit. Reproduced with permission. ^ Dr. William O'Brien Jr., Professor, Bioaccoustic Research Laboratory, Department of Electrical and Computer Engineering, University of Illinois. *** Color doppler image courtesy of Dr. Greggory Devore. Reproduced with permission. Dr. Susan Lenz's image courtesy of Dr. Lenz. Reproduced with permission. Picture of parenting magazines coutesy of Medison®. Dr. Baba's images of his setup courtesy of Dr. Baba. ^ In Diagnosis and Therapy of Fetal Anomalies. John C Hobbins and Beryl R Benacerraf (eds), Churchill Livingstone, 1989.
some who may have been less well-known than the others and some who may not have published so extensively in the English language. Apologies are extended to those whose contribution has not been fully credited in this article. All original contents Copyright © 1998-2001 Joseph SK Woo. All Rights Reserved.